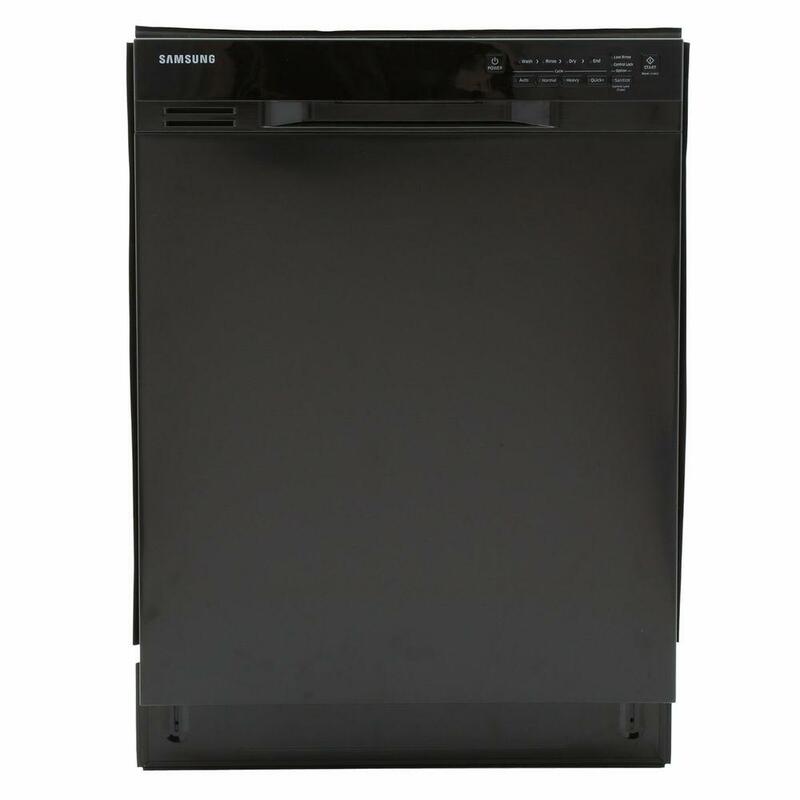 This energy-efficient Samsung dishwasher delivers powerful, yet quiet performance with features like a stainless steel interior, hard food disposer, and adjustable racking system. And with a unique noise prevention design, you won’t have to talk over your stainless steel dishwasher or turn your TV volume up ever again. Does this unit have heated drying (a heating element usually in the bottom), or does it only rely on the interior stainless steel shell for drying? This dishwasher does not dry the dishes thoroughly. The cups had water in the bottom. Even with the door open, that would not evaporate the water so I had to dry them with a cloth. It is very quiet, the best thing about it. If you are only using it once in awhile, it is not a bad product. I would not recommend it for everyday use. How long is the wash cycle? you have to different options. Higher than other dishwashers I have ever seen. do these come with a kick plate? 24 in. Front Control Dishwasher in Black with Stainless Steel Tub, 50 dBA is rated 3.5 out of 5 by 1004. Rated 1 out of 5 by kds from This dishwasher does not clean well, does not dry well, and unbelievably the entire machine is he... This dishwasher does not clean well, does not dry well, and unbelievably the entire machine is held up by one tiny piece of plastic that will fail on you, and Samsung won't repair it. Unlike almost every other machine, this machine has plastic leveling feet [instead of metal]. The plastic leveling feet screw into the bottom of the machine and are supported by one tiny piece of plastic. When ours broke Samsung made it very clear very quickly that they had zero intention of honoring their warranty, even though we were still within the warranty period by about two weeks. Some of the more memorable excuses we were given were: "well, the warranty period is almost over, and Samsung doesn't like to do repairs when the warranty is almost up," and "leveling feet are cosmetic, and we don't cover cosmetic damage." They refused to repair the machine. No more Samsung products for us after this experience. Rated 1 out of 5 by Jessie from BUYER BEWARE!!! This is a terrible dishwasher. Did not clean from the first day it arrived. I tried all the detergents recommended by the manufacturer. Dishes, and particularly the utensils, came out with a white film all over them. I had to rinse the glasses and buff the knives/forks/spoons to remove the white film. Then the electrical panel started giving me various error messages. When I called Samsung, everyone was nice but no one would do anything to help me. I had this dishwasher for less than 6 months when it started having electrical trouble. It didn't take many calls before I realized Samsung was not going to stand by this product. Rather than spending months and MANY phone calls, I decided to cut my losses and buy a new dishwasher from another manufacturer beginning with a B. After all, this unit never cleaned well and if they fixed the problem what would I have -- a dishwasher that ran but didn't clean. My blood pressure is worth not fighting with Samsung. Rated 5 out of 5 by pdog from Works well so far... This is a replacement for our dishwasher that was over 20yrs old, so unsure if I am a good reviewer for this type of item or if anything is better nowadays. With that being said, I am happy with the purchase so far and would recommend it. Pros: - It works. Dishes are clean. Another disclaimer - I still clean off dishes before I put them in the dishwasher. I don't stick dishes with massive amounts of food on them like on TV commercials. Where does that food go? - Quiet. Super quiet. Again, I had a super loud one before though. - Looks nice. Thought the super white would be a bit much, but looks good. - Holds a lot, like the adjustable top tray which was easy to adjust. - Stainless tub - main reason I got this one, our old plastic one was stained. Plus nicer to have stainless next to your plates, etc... instead of plastic (yea, I know the racks are coated with something, but they all are...) Cons: - Buttons are easy to reach for my 1.5yr old. I lock them out, but then always have to unlock them out and re-lock to use. - Minor complaint is the silverware tray top thing always seems to get in the way. Overall very happy with the purchase. Rated 1 out of 5 by iwouldbuyLG from Terrible, terrible, terrible Shipped to us broken and missing a drawer wheel. Missing wheel caused the drawer to shift which caused damage to the gasket. TWICE repairmen could not fix and the second "expert" made the situation worse. Used a machine screw to fix the problem... Decided to change out the hose because of the constant terrible odor. Samsung will tell you to use Tang after each wash to solve smell issues. When we pulled the unit out, we see the entire bottom is cracked. Of course now it is past warranty. We paid for unit to be delivered and installed. HOW WOULD I KNOW THAT THE BASE OF THE UNIT WAS CRACKED? Samsung has denied any claim. NEVER GOING TO BUY SAMSUNG AGAIN. Rated 1 out of 5 by neverbuysamsung from No wonder it is discontinued! An absolute piece of junk! Shipped to us missing a drawer wheel. ... No wonder it is discontinued! An absolute piece of junk! Shipped to us missing a drawer wheel. Had TWO Samsung repairmen come to "fix" a gasket problem only for the second repairman to make it worse. Later figure out damage caused by missing wheel. Fixed with a machine screw. Always smells. Samsung tells me to use Tang after every wash. Really? SO, decided to change out the hoseline. Take the unit out and the entire base is broken. WE HAD HD SHIP AND INSTALL THE UNIT. Now I see that the unit is broken but Samsung will not replace because it is out of warranty. HOW WOULD I KNOW THAT IT IS BROKEN WHEN IT IS INSTALLED?? Never will buy Samsung again. Rated 2 out of 5 by zero from I am really disappointed with my Samsung Dishwasher! I only give it 2 stars for the following rea... I am really disappointed with my Samsung Dishwasher! I only give it 2 stars for the following reasons; pros: 1) The dishwasher is very quiet while running, you almost can not hear it while on. 2) Easy to operate. Cons: 1) It does not clean well. I always have some dishes that still have food on them. This happens with all cycles used. 2) It does not hold dishes efficiently in order to hold a average capacity. For Pots and Pans it becomes a challenge to include with regular dish loads. 3) I feel the price does not reflex how the product actually performs. Meaning, I expected better performance for what I paid. Now I feel like I am stuck with this dishwasher because returning it probably is not an option as there is not a material defect in the dishwasher. At least I do not think there is, it is just poorly designed. This is my 1st time buying a dishwasher and like most things in life you live and learn. Well that is my experience and I hope it helps some one make a better purchase then I did! Rated 1 out of 5 by Disappointed from Buyer Beware We purchased this Samsung dishwasher in August 2014 as part of a remodel project. We did not install it until October and did not have a chance to use it until February 2015. It is now March 2015 and the dishwasher DOES NOT work. We probably only used it 10 times. We called Samsung since it was still under the one year warranty. Because we live in the country, Westcliffe, CO, and are more than 50 miles from the closest authorized repair person Samsung ONLY offered to refund our purchase. They did not offer to pay for the deinstallation cost of the current machine and the delivery fee and installation charge for a new dishwasher. Our other concern is that we have three more Samsung appliances, stove, refrigerator and microwave. I assume we cannot get service on those appliances either. I wish I'd researched Samsung's reliability which is the worst according to Consumers Reports. I would NEVER purchase another Samsung appliance. Rated 1 out of 5 by Neveragain from Flimsy product, the racks always fell out when loading. Dishes do not come clean. You cannot bypa... Flimsy product, the racks always fell out when loading. Dishes do not come clean. You cannot bypass the dry cycle. The motor broke just past the one year mark and was not covered under warranty. I am currently without a working dishwasher and shopping for a new one instead of having Samsung charge me $160 just to come and look at it.